Syria is demanding that the UN Security Council call an emergency meeting to discuss U.S. President Donald Trump’s decision to recognize the Golan Heights as Israeli territory. Iran, Russia and the Gulf Arab state are of one accord with Syria in their opposition to Trump’s surprise action which was hailed by Israel for the unexpected boost to its national security. Four Gulf Arab states which are U.S. allies and host American troops – Saudi Arabia, Bahrain, Qatar, and Kuwait – also rejected Trump’s decision. The Syrian mission to the United Nations asked the Security Council presidency, held by France, to schedule an urgent meeting to “discuss the situation in the occupied Syrian Golan and the recent flagrant violation of the relevant Security Council’s resolution by a permanent member-state,” AFP reported on March 26. The Security Council presidency did not immediately schedule the meeting and diplomats said there would be a discussion at the council about the request, the report said. 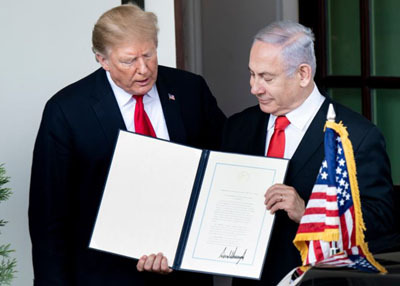 Trump on March 25 officially recognized Israeli sovereignty over the Golan Heights, which Israel liberated from Syria during the 1967 Six Day War and then annexed in 1981 in a move not recognized by the international community. Syria accused Trump of “blatantly attacking” its sovereignty with the decision. “Trump does not have the right and the legal authority to legitimize the occupation,” said a Syrian Foreign Ministry source. U.S. acting Ambassador Jonathan Cohen told a council meeting on the Middle East that Washington had made the decision to stand up to Syrian President Bashar Assad and Iran. “To allow the Golan Heights to be controlled by the likes of the Syrian and Iranian regimes would turn a blind eye to the atrocities of the Assad regime and malign and destabilizing presence of Iran in the region,” said Cohen. There “can be no peace agreement that does not satisfactorily address Israel’s security needs in the Golan Heights,” he added.